The Borromei are one of Italy’s most ancient families and can trace their origins with some certainty back to the tenth century. They were originally Tuscans, from the town of <?xml:namespace prefix = st1 ns = "urn:schemas-microsoft-com:office:smarttags" />San Miniato al Tedesco on the main trade route between Florence and Pisa . After a failed rebellion against Florentine rule in 1370, when Filippo di Lazzaro Borromei was hanged as one of the ringleaders, they fled the town and settled in other parts of Italy . By the late fourteenth and early fifteenth centuries there were three main branches of the family, one in Milan, a second in Venice and a third in Florence . There were also major banking companies in all three places headed by a member or members of the family. No comprehensive study of the family exists for the period with which we are concerned. If not otherwise stated, information on members of the family for this period (with different degrees of detail and of reliability) has been drawn from Dizionario Biografico degli Italiani (Rome, 1960), vol. xiii, by name (and especially essays by Giorgio Chittolini and Florence Edler de Roover at pp. 45-46, 48-49, 53-55, 63-64, 72-75); Piero Canetta, La famiglia Borromeo (Milan, 1937); Pompeo Litta, Borromei di S. Miniato, in Famiglie celebri italiane (Milan, 1819-74), vol. iv, by name. The manuscript sources used are: Archivio Borromeo dell’ Isola Bella (ABIB), box files 661 and 1051; and Archivio di Stato, Florence (ASF), Manoscritti 593, Carte Pucci, sc. III, folders 14, 25; ASF, Ceramelli Papiani 915; ASF, Catasto, 81, cc. 508r-513r; Catasto 405, cc. 78-84. For the Borromei companies until the beginning of the fourteenth century, see Federigo Melis, La banca pisana e le origini della banca moderna, ed. Marco Spallanzani (Florence, 1987), and especially pp. 224-32; for the 1420s, 1430s and 1440s see Girolamo Biscaro, ‘Il banco Filippo Borromei e compagni di Londra (1436-1439),” Archivio Storico Lombardo, s. iv, vol. xix, 40 (1913): pp. 37-126, 283-386; Tommaso Zerbi, Le origini della partita doppia (Milan, 1952), pp. 311-68, 413-46; Patrizia Mainoni, Mercanti lombardi tra Barcellona e Valenza nel basso medioevo (Bologna, 1982), pp. 90-110; Philip Jacks and William Caferro, The Spinelli of Florence. Fortunes of a Renaissance merchant family (Pennsylvania, 2001), pp. 39-51. In the family archive at Isola Bella there are eight surviving ledgers for Borromei companies across Europe: Mastri nos. 4 and 5 for Giovanni Borromei & co. of Milan (1427, 1428); no. 7 for Filippo Borromei & co. of London (1436-39), which will be here referred to as BLon; no. 8 for Filippo Borromei & co. of Bruges (1438), which will be referred to as BBr; nos. 9, 10, 11 and 12 for Filippo Borromei & co. of Milan (1445, 1446, 1451-52, 1453-55). This is a brief account of the family’s history because the prime concern here is the Bruges ledger and its contents. This website is based on the work of the Borromei Bank Research Project which came into existence on 1 July 2001, following a successful application to the Economic and Social Research Council made by Professor Jim Bolton (Award R000239125). Dr Francesco Guidi Bruscoli joined on 1 January 2002. Before then, in November 2000, permission had been granted by principessa Bona Borromeo-Arese for the exclusive use of the ledgers and other allied material for research and publication. The main purpose of the project is to create electronic database versions of the two ledgers kept by the Borromei banks in London (1436-39) and in Bruges (1438). Roundhouse Software of Winchester has written software to create the databases and to analyse them, Roundhouse-Queen Mary Historic Accounts I® and Historic Accounts Enquiry®. These can be used for any ledger or account book kept in double entry and in money of account, medieval or modern. Roundhouse has also created this website. We have received further valuable financial assistance from The Westfield Trust, the History Department, Queen Mary, University of London, and the successive Vice-Principals for Arts and Humanities at Queen Mary, Professors Philip Ogden and Trevor Dadson. 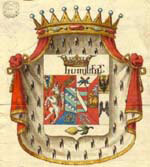 Copyright to all the images taken from the Ledger of Filippo Borromei & co. of Bruges and to the Borromeo-Arese coat-of-arms belongs to the Borromeo-Arese family of Milan. No images of original material can be reproduced in any form without their permission. Copyright of the text of the Introduction and the Indexes and to the translated and calendared version of the Ledger belongs to J.L.Bolton and F. Guidi Bruscoli. Copyright to all the software used to produce the database and for the search tools is vested in Queen Mary, University of London, and RoundHouse Software Ltd. It cannot be used without a licence from them.